They are keeping our nation safe and safety for them should be our motive. Their environment full of extremities and they exposed to hazardous and life-threatening situations like gases and chemicals, dangerous objects falling on their feet etc. The injuries that can be sustained on the metatarsal of the ankle can be painful and the recovery process is also lengthy. Therefore, we at Warrior understands the need and importance of safety shoes and we strive to give our soldiers a perfect weapon to protect their feet and combat work place hazards. Lacerations, cuts and severed toe injuries can occur in people who work with equipment like chain saws. Fractures and sprains can happen in a wide variety of workplaces. They are usually caused by trips and falls. Warrior designs army shoes and combat boot to help our soldiers fight with the odds at their workplace related to foot injury. Our safety shoes are made from durable materials like poly-urethane and pure leather. 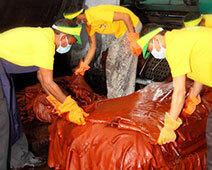 The outer materials of the shoes are resistant to oil, chemicals, fat, blood, water and other materials that can cause mishaps in the workplace. The soles have anti-puncture qualities to ensure that sharp objects do not penetrate through them and the inner soles also provide additional protection and comfort to the wearer. With the different kinds of safety shoes like army shoes and combat boot available, there is no reason for our country’s soldiers, not to protect their feet regardless of the kind of environment they work in. 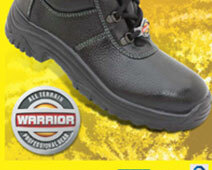 At Warrior Safety shoes, from the house of Liberty, we do our best to offer reliable and affordable protective wear. So let our soldiers select their safety shoes from our wide range of safety footwear and combat the foot hazards at workplace.